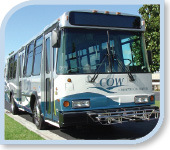 The City of Cerritos currently provides the community with the Cerritos on Wheels (COW) fixed-route transit service and Dial-A-Ride demand response service. For more information on each service, please click the links provided below under "Local City Transportation". Passengers may track COW buses in real-time with a new app that can be downloaded from the City's website. The addition of real-time transit information will allow riders to know the exact location and arrival time of each bus in service at any point along the route. This new technology puts riders in control of their schedule by minimizing wait time at any COW bus stop. The information is accessed in real-time from any computer, tablet or smartphone. Download the new COW app or click the link provided below to check the location of buses in real time. Available for iPhones and smartphones with Android operating systems. 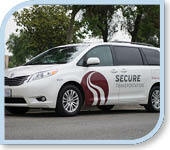 Beginning March 29, 2016, all Cerritos Dial-A-Ride trips (Cypress College, Tier 1, Tier2, and Tier 3) will be serviced by a new service provider, Secure Transportation. All vehicles will be wheelchair accessible and Secure Transportation vans will be used to transport passengers. No changes will be made to hours of operation, fares, or service area. For more information or to make a reservation, please call (562) 402-7433 or (562) 916-1202. Hours: Weekdays 6 a.m. – 8 p.m., Saturdays 9 a.m. – 5 p.m.